Golgonooza Letter Foundry & Press | Letters cast in the real world. Golgonooza Letter Foundry & Press designs, composes, prints and with Enitharmon Bindery binds fine hand made books for our publishing wing Trois Fontaines and for the public. As a foundry we have 43 different English and American Monotype typefaces. We can also cast many of the sizes of the ATF Garamond, Garamond Open and De Roos matrices we hold. 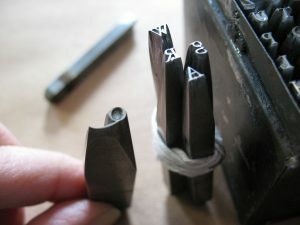 In addition we have created two award winning new metal typefaces using hand-cut punches, named Regulus and Parmenides. We have been casting metal type for 28 years and printing metal type for 31 years. In addition we have given lectures on the History of Type and Punchcutting across the US and in England, Germany and Greece.